May 2012 Spring has sprung!! I love this time of year, even though April’s weather seemed colder than March. It’s always an exciting time of year–watching to see what is going to pop out of the soil. I love perennials and each year the garden evolves, whether I want it to or not. The Dunnville Home and Garden Show was a huge success! Our booth was gorgeous, thanks to the many volunteers who helped out. Congratulations to the winners of our raffle: 1st prize (Teak arbour) Sue Tew of Dunnville, 2nd prize (metal garden bench) Gord Pyle of Dunnville, and 3rd prize (garden planters) Bruce Nevils of Dunnville. We gave out over 1000 seed packets to folks who visited our booth, and signed up 18 new members. It was great to see everyone. A huge thank you goes out to everyone who helped with setting up, taking down and supervising our booth. Great job! Saturday, May 12th is our annual plant sale. 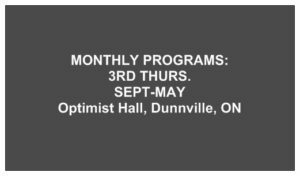 This year it will be held at our new home, the Dunnville Optimist Hall. The sale will be held from 8 a.m. till approximately 12 noon, rain or shine. We would appreciate any donations that members may be able to make of any kind of perennials, annuals, trees, shrubs etc. Each plant must be potted and labelled with the name of the plant and sun conditions required. If you have something that you’d like to donate please bring it to the Optimist Hall parking lot between 6:00 p.m. and 8:00 p.m. the night before. The Dunnville Town flowerbeds are going to need attention soon. We need teams of volunteers to help with prepping, planting and weeding of the various beds that we look after. The flowerbeds that we look after include the Anchor project in Wingfield Park, the BIA “Dunnville” sign at the east end of town by Inman Road, the “Dunnville” sign at the west end of town by Robinson Road, the “Dunnville” sign in down-town at Queen & Main Streets near the bridge, the Dunnville Public Library, Centennial Park, the Floral Clock at the bridge and a few others throughout the town. You don’t have to commit to a lot of time; an hour or two here and there when it’s convenient to you would be appreciated. Please see Lori Maracle if you would like to help out. This qualifies for community service if there are any high school students who would like to get involved. Garden Tip of the Month: Get outside! Break off wilting Tulip or Daffodil heads but continue to feed and care for them until the foliage has died back naturally. This helps to store energy in the bulbs. It is best not to dig or move flowering bulbs until their foliage has died back. Pansies, Snapdragons, Dianthus, Petunias, Geraniums and Impatiens should be ready to plant by mid month. Toward the end of the month, it should be warm enough to plant out the more tender annuals like Salvia, Zinnias, Marigolds, Lobelia. Lightly side dress perennials with an all-purpose 5-10-10 or 10-10-10 fertilizer. Avoid spilling the fertilizer on the plant, and use care not to damage the shallow roots when you cultivate it into the soil. Carrots, lettuce, potatoes, corn, beans, peas and most popular vegetables (with the exception of the warmer weather crops) can be seeded or planted into the vegetable garden at any time now. Wait until mid to late May before planting the warmer weather crops like tomatoes, squash, cucumber, pumpkins and peppers. With a little luck, you may begin to see the first fruit on your strawberries by late this month. The birds will enjoy them very much if you don’t provide some protective netting over them. Happy gardening everyone! This is the month we live for! Meeting was opened by Kim Christoff at 7:06 p.m. There were 45 members signed in. Minutes: April’s minutes were read. Vel Levatte moved to accept them as read, and Janine Jungas seconded the motion. All were in favour. Treasurer’s report was read by Kim. We have 102 members to date. The plant sale on May 12th was a huge success. We made $1826.00. Thank you to all the volunteers who helped out. The Home Show was a big success as well. We signed up 18 new members and the raffle raised $738.00. The teak arbor was won by Sue Tew, the bench by Gord Pyle (both from Dunnville) and the planters were one by one of our own members, Bruce Nevils. Raffle tickets were sold this evening on a lovely gift basket donated by Hauser’s Pharmacy. There was no Ways & Means draw due to time constraints. GARDEN WALK: Thursday, June 21st. Master Gardener Beth Powell has graciously opened up her garden to us for a private visit on the evening of the 21st. There will be no General Meeting at the Optimist Hall on this date. Ms. Powell’s property is located at 440 Concession 1 North, Canfield, Ontario N1A 1C0. Please see attached map for directions. If you would like to carpool, please meet at the condo river front parking lot (next to the bridge) at 6:30 p.m. We will be leaving at 6:45 p.m. sharp. After the garden walk we will be going to Judy’s place for potluck. Please see Judy regarding what she would like you to bring. Please see the attached map for directions to her house. TRILLIUM AWARD NOMINATIONS: June 16-30th. We will be accepting nominations for trillium awards during this period. If you know of a property that you would like to nominate, you can pick up a nomination form which can be found at all the local garden centres and many other businesses in town. We will also try to put a nomination form on our website that you can print so please visit our website at www.dunnvillehortsoc.gardenontario.org. Please see the attached map to see the physical boundaries set out by the Dunnville Horticultural Society for eligible properties. If you have any questions regarding the Trillium Award program please see Kim Christoff or Lori Maracle. GENERAL MEETING July 19, 2012: The Ministry of Natural Resources will be sending a speaker to talk to us about invasive species (plants and animals). We would like to stress that this meeting is “All Welcome and Open to the Public”. This person will be travelling from Peterborough and we would like to attract as many people as possible to this meeting. Please invite your friends and neighbours to come and learn about this very important topic. In case you were looking, I forgot to include a copy of the Trillium awards boundary map. If you have any questions about the boundaries please contact me and I will be happy to email a copy of the map to you. Lori Maracle spoke about the town flowerbeds. They have been weeded, edged and mulched. They are ready for planting. We will not be planting the bed where the old Hydro building used to be. The area is under heavy construction and therefore it would be futile. Lori also told us that students from Dunnville Secondary School’s environmental class will be planting the flowers at the Floral Clock. Students from the construction class have made new numbers. The Dunnville Chronicle will be doing a story on May 29th when the numbers are installed and the flowers are planted. Congratulations to everyone involved. Maura requested 2 volunteers to help in the kitchen at the July general meeting. We need judges for the Trillium Awards. You can judge and still win an award as long as you are not judging your own property. Please see Kim if you would like to help out. It will certainly be an opportunity to learn more about landscaping and horticulture. Thank you to both speakers who shared their wealth of knowledge. Sherry Hayes, who writes a column for the Hamilton Spectator and owns “Landscaping by Design,” spoke about xeriscape gardening. Xeriscape literally means dry gardening. She taught us about many plants that are considered drought tolerant. Lester Fretz spoke about Sweet Potatoes. He was very informative and gave everyone slips of sweet potatoes to grow at home. I have a feeling that everyone will be eating sweet potatoes for a long time to come. After the lectures, Judy addressed the group, recapping this month’s new business. She also informed us that the list of classes for the Rose and Flower show will be listed on our website. Rose Draw: May is traditionally our members’ Rose Draw. Only members who signed-in were eligible to win a rose. There were 10 in total. The winners were: Betty Ballinger, Pauline Bradford, Kim Christoff, Jean Cowan (who declined), Lori Maracle, Debbie Wilson, Kirstine Asher, Rob Maracle (who declined), Sam Visser, Joyce Coverdale, Carol Beauparlant, and Mary McKinney. Kirstine Asher won the Gift Basket. Congratulations to everyone! Thank you to Betty Ballanger for selling the tickets. $68.25 was raised. Good job! Thank you to Maura Cooper and her kitchen volunteers for a job well done. Everything looked and tasted wonderful! Meeting was adjourned at 9:20 p.m.